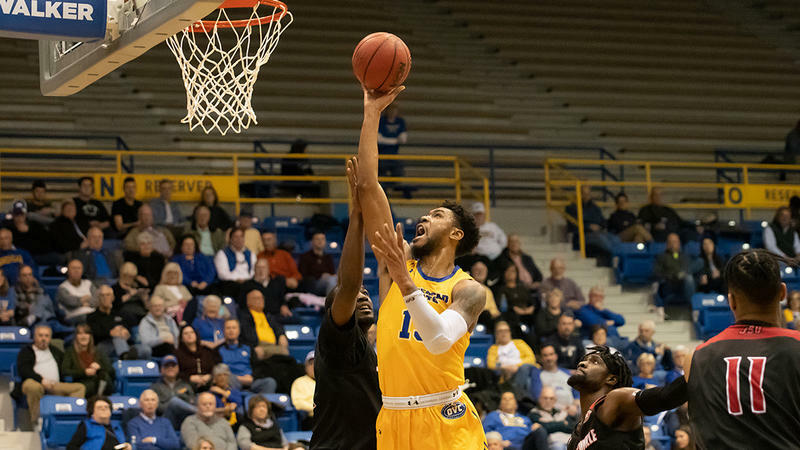 An early lead went by the wayside in the first half, but Morehead State's men's basketball team fought until the end before falling 96-86 to OVC first-place Belmont Saturday at Johnson Arena. MSU led by as much as five in the first half and held a 27-26 advantage before Belmont started pouring in triples. The Bruins started 2-for-10 from long range but then hit nine of the next 11 and pulled ahead 53-37 by the end of the half. MSU pulled to within six on three occasions late in the final half, coming closest at 78-72 with 4:31 remaining. Morehead State outscored Belmont 49-43 in the final half. The Eagles fell to 9-16 overall and 5-7 in the OVC, while the visitors catapulted to 19-4 overall and 10-2 in the league race. Belmont's Dylan Windler was a bugaboo to guard for the home team as he scored a game-high 41 points, including eight three-pointers. He also completed the double-double with 12 rebounds. "I really thought we played hard, and there were certainly some positives today," said head coach Preston Spradlin. "It just took an exceptional effort by one of the best players in our league to get past us on our home floor. He had 26 points at the half, and I give credit to (junior guard) Jordan (Walker) for his defense in the second half. Windler was kind of the beneficiary of some late free throws to get to 41, but if we had the same type of defensive effort on him in the first half, he probably would have still scored 20-something but we might be looking at a different outcome." For the second straight game, senior guard A. J. Hicks led his squad in the scoring column with 22 points to go along with five assists. It's Hicks' first instance scoring 20 or more in back-to-back games. Senior forward Lamontray Harris tied his season high in points with 20 while also securing eight rebounds. Walker scored in double digits for the 16th time in the last 17 games with 18 markers, while sophomore De'Von Cooper notched 14 points. "I thought we had great execution, and Lamontray really responded in the second half," said Spradlin. "It's just hard to give up 96 points and expect to win, but I was proud of our intensity and effort." Harris had 16 second-half points. Belmont finished 15-of-30 from three-point range, but the Eagles did out-rebound the Bruins 39-31. Sophomore James Baker led the team with nine caroms. MSU finished at 50 percent (35-of-70) for the night, while Belmont hit 53 percent. The Eagles are back at home next weekend when they host Eastern Kentucky and Austin Peay. The rivals from Richmond come to town Thursday for a 7:35 p.m. ET contest. Junior guard Jordan Walker scored a career-high 30 points, including 18 in the second half, and senior forward Lamontray Harris joined Morehead State's 1,000-point club as the Eagles erased a big first-half hole and defeated Eastern Illinois 84-78 Saturday at Lantz Arena. The Eagles, who had only won four previous times in 19 tries at EIU, improved to 9-14 overall and 5-5 in the OVC. The host Panthers slid to 6-4 in conference contests and 13-10 overall. 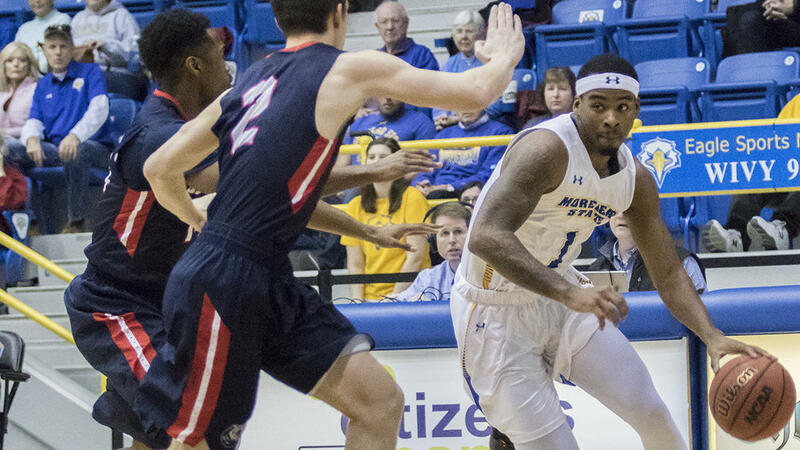 The Morehead State men's basketball Eagles ultimately fell to Jacksonville State, 77-71, Saturday afternoon at Johnson Arena. The Eagles showed guts and grit throughout 40 minutes. But the home team came out on the losing end of a back-and-forth battle that saw six ties and 10 lead changes, with neither team leading by more than six until the closing minutes. With today's result, the Eagles move to 8-13 on the season, 4-4 in Ohio Valley Conference play. Jacksonville State advances to 15-6 overall, and 7-1 in league action. 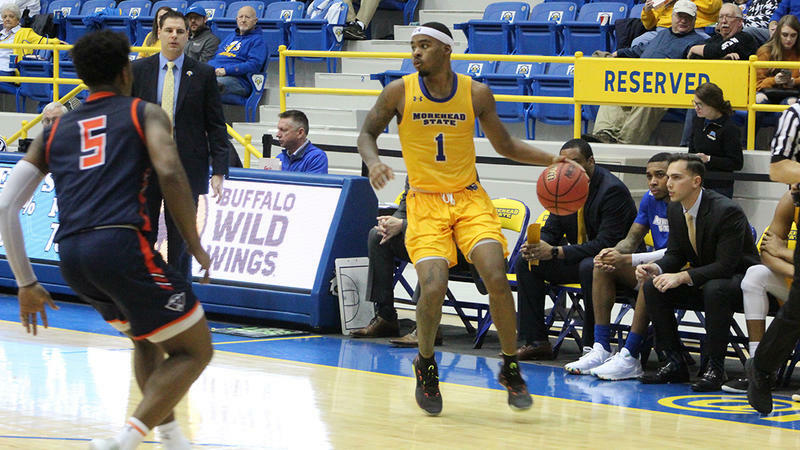 The Morehead State men's basketball Eagles catapulted themselves to a victory via a season-high in field goal shooting, downing the UT Martin Skyhawks 85-77 Saturday evening at Johnson Arena. The Eagles are now winners of their last three games, heading into next week's slate at 7-12 overall and 3-3 in Ohio Valley Conference action. With the loss, UT Martin regresses to 5-12, 0-6 in the league on the year.